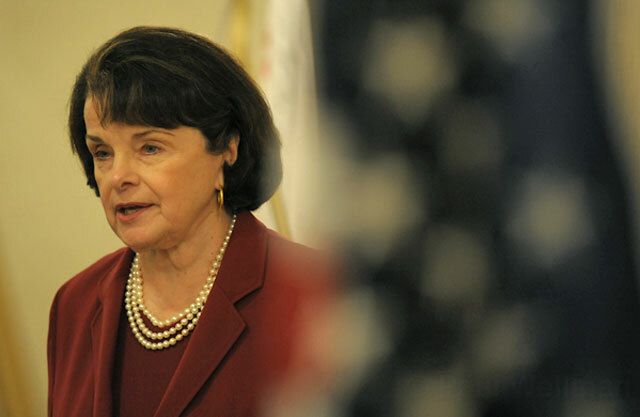 In her rookie year in the U.S. Senate, Dianne Feinstein labored to pass a federal ban on assault weapons, to chuckles and condescension from Republican colleagues. “So the gentle lady from California needs to become a little bit more familiar with firearms and their deadly characteristics,” one red-state worthy rose to mansplain, after she finished an impassioned floor speech. “I am quite familiar with firearms,” Feinstein coolly answered, in a response that instantly marked her as a D.C. player of consequence. AR-15 idée fixe. Within about a year of that showdown with former senator Larry Craig of Idaho (whose claim to fame, a few years later, came when he was busted for lewd conduct in an airport bathroom and minted the timeless phrase “have a wide stance.” But we digress), Feinstein got the weapons ban signed into law. The measure expired in 2004, however, and no new federal gun-control measure has passed since. Debate continues over the effectiveness of her 1994 assault weapons law — but there is no argument that it would have outlawed guns used in last fall’s slaughter of 58 in Las Vegas and last month’s killing of 17 at a Florida high school, among other mass shootings. Today, facing a primary challenge from a lefty Democrat after a quarter century in the Senate, Feinstein again is leading an uphill effort for a weapons ban, a policy, political and personal idée fixe of her career. “I am not going to stop, ladies and gentlemen, until we get those AR-15s off of the streets and out of the hands of people who would use them to kill others,” Feinstein thundered at the state Democratic convention two weekends ago, to a roar of applause at a delegate breakfast. Party snub. That speech, however, was the highlight of her otherwise dreary convention weekend in San Diego: The party endorsed neither her nor challenger State Senate leader Kevin de León, but he won the raw vote of delegates, 54 to 37 percent. Trying to boost De León’s anemic fundraising, Team Kevin portrayed the vote as a seismic event (“an astounding rejection of politics as usual”) while Beltway genius pundits found apocalyptic narratives in the result (“The first sign of lunacy was the delegates’ refusal to endorse impeccably liberal Sen. Dianne Feinstein,” bellowed the New York Post). As a practical matter, however, the party’s action will likely have about as much impact as publishing poetry. For starters, it’s not exactly news that Feinstein has an arm’s-length relationship with the lefty activists and Sacramento hacks that dominate state party politics — she’s been booed at least twice at conventions, once for backing the death penalty, another for praising the troops during the first Gulf War. Also, it’s arguable that she actually won by losing — by blocking De León’s endorsement, which might have been a critical campaign signifier, on what essentially was his home turf. A both-and issue. In emphasizing her long crusade and past success on gun control in the campaign, Feinstein not only highlights her pragmatic ability to pass legislation but also burnishes her liberal credentials against De León’s progressive-purity line that she’s a Trump accommodationist. Beyond her massive advantages in the polls (46 to 17 percent in the latest Public Policy Institute of California survey) and fundraising ($9.8 million to $359,000 in the bank), it’s telling that in popular culture, Feinstein is depicted as a chief foil to the president, as when Cecily Strong played her last weekend in a Saturday Night Live skit about his White House gun summit. More: Trump even has a Twitter insult name for her — “Sneaky Dianne” — for her steadfast pursuit of the Russian election interference investigation.